On this day in Duluth in 1912, the Northern Pacific Railroad agreed to cede property in Duluth along the Lake Superior shore east of Minnesota Point, clearing the way to create Lakeshore Park—today’s Leif Erikson Park. The 1912 plans for Lakeshore Park included building a seawall from the north pier of the ship canal to the shore at Ninth Avenue East. The lake between the seawall and the point were then to be filled in with “useless dirt from excavations and a thousand other sources,” expanding the waterfront eastward. Plans included four baseball diamonds, tennis courts, and a football stadium. The park was intended to connect with Cullum Park (named for Marcus B. Cullum, Duluth’s mayor from 1910–1912) at Eighth Street. The grand seawall/waterfront expansion never happened, and Cullum Park was renamed Lakeshore Park, which was later renamed Lief Erikson Park. 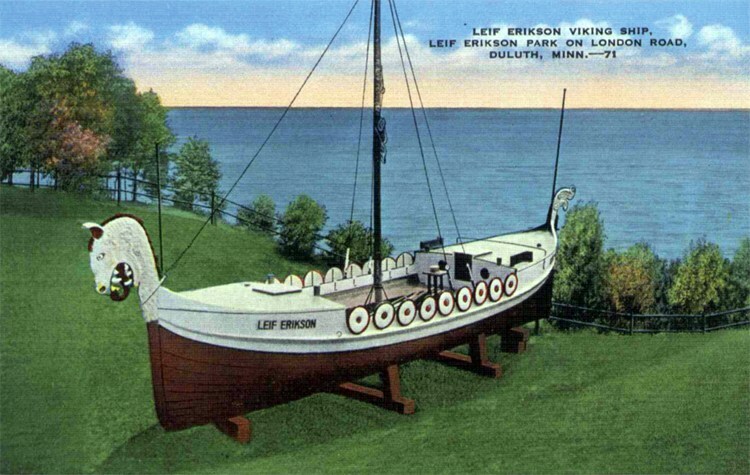 Read the complete history of Leif Erikson Park here.